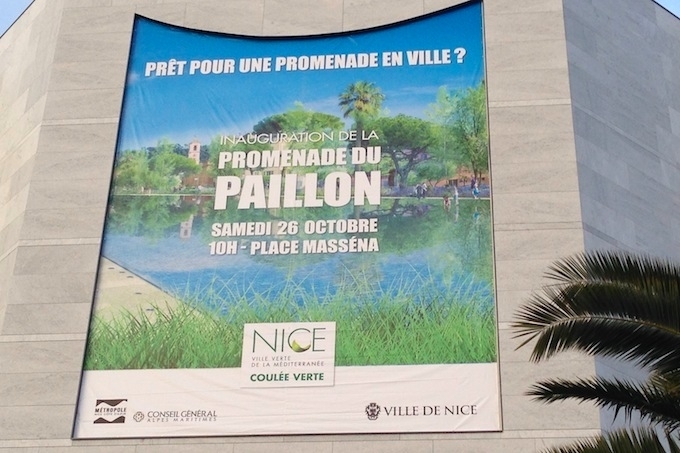 After two years of majorily disruptive works, the new Promenade du Paillon will be officially opened in Nice this coming Saturday. Ever since the demolition of the old Gare Routière Côte d’Azur back in 2011 and Parking du Paillon last year, the landscape around Nice has been gradually changing and taking on a more environmentally friendly look. What we have all come to know as La Coulée Verte now becomes the Promenade du Paillon, a swath of green open space, stretching from the Théâtre de Verdure on the Promenade des Anglais, all the way back to the Théâtre National de Nice. The €40 million project will be officially inaugurated this Saturday, 26th October, with an action-packed day of fun for all the family. The festivities start at 10am in Place Masséna, with musical entertainment, the showing of a film, and a special water show involving the new fountains. The full programme for the day is available on the Ville de Nice website. Here is a look at what was, way back when, and a sneak peek at what to expect in advance of the official unveiling of the new green belt — though it is evident that there is still a ways to go to get everything completed for the big day. Allez les gars! My apartment is going to have the best views.